The Nizam-ul-Mulk of Hyderabad, popularly known as the Nizam of Hyderabad, was a monarch of the Hyderabad State. Nizam, would mean the administrator. The Asaf Jah Dynasty was founded by Mir Qamar-ud-Din Siddiqi, and he ruled after Aurangzeb's death in 1707. In 1724, Mughal control lapsed, and Asaf Jah declared himself independent in Hyderabad. Following the decline of the Mughal power, India saw the rise of Maratha Empire. The major battles fought between the Marathas and the Nizam include Palkhed, Udgir, Rakshasbhuvan, and Kharda, in all of which the Nizam lost. In 1947, Nizam wanted to keep Hyderabad independent, unlike the other princely states, most of which acceded to India or to Pakistan voluntarily. In September 1948, in Operation Polo, the Indian Army marched into Hyderabad, deposed the Nizam, and annexed the state into the Indian Union. 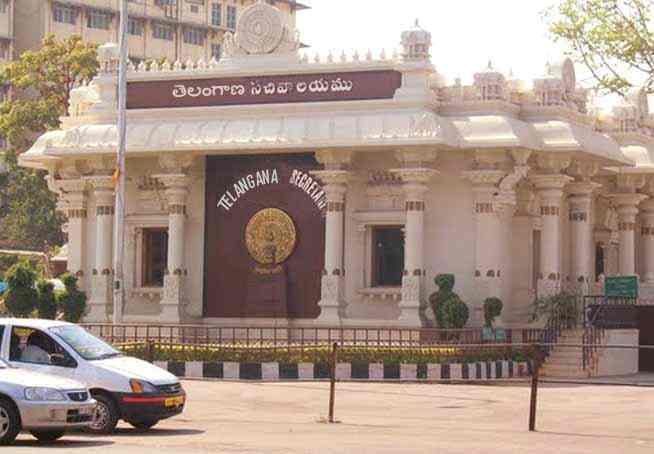 Government of Telangana is the new State Government that has its capital at Hyderabad and is seated at the Government Secretariat or the Sachivalayam. The Government of Telangana was formed on 2 June 2014 after bifurication of Andhra Pradesh as part of Andhra Pradesh Reorganisation Act, 2014. After assuming power in a long meet the Cabinet ministers along with CM KCR decided in shifting the Secretariat office to the Erragadda Chest Hospital location where a new Secretariat complex was to be constructed at a estimated cost of Rs 150 crore. The hospital there was to be shifted to another location. There have been reports in the media and today BBC reports that the Chief minister of Telangana is planning to raze a government complex and build a new one at an estimated cost of 3.5bn rupees, because he believes the building is unlucky for the state. The story of the "curse" of Saifabad Palace goes back to sometime in 1888. The sixth Nizam (king) of Hyderabad, Mahboob Ali Pasha, was on his way to inspect the construction of the palace in what was then the kingdom of Hyderabad. Two nobles, who did not want the Nizam to occupy the palace, ensured that a monitor lizard crossed his path - a bad omen. The Nizam immediately ordered the palace to be locked up. It was only in the 1940s that a senior government official converted it into the administrative office of the kingdom. The Saifabad palace, now a heritage structure, is still at the centre of the present-day secretariat complex which houses the state governments of both Telangana and Andhra Pradesh. Like the sixth Nizam, the Telangana Chief Minister, K Chandrasekhar Rao, also believes that the secretariat complex is unlucky. So he plans to raze the entire complex to the ground and build a new administrative centre. The report puts that he has such a strong aversion to the building that he hardly ever visits it - only once or twice a month for cabinet meetings. He prefers working out of his official residence in the city or from his personal estate, which is 60km (37.2 miles) from Hyderabad. Mr Rao believes the vaastu (similar to feng shui) of the secretariat is not good for Telangana. Vaastu is an ancient Hindu treatise of construction. Believers consider it a science ! "Definitely this secretariat has bad vaastu. History is proof that no one has prospered because of this. Let Telangana not suffer," Mr Rao told the BBC. Critics say this would not have been an issue if the complex was a crumbling, rickety structure that was endangering the life of the thousands of government employees working there. But much of the secretariat consists of recent constructions, which are less than a decade old. Mr K Chandrasekara Rao is undeterred by the criticism. He has already met the governor of the state and asked him to tell his Andhra Pradesh counterpart Mr Chandrababu Naidu to vacate his part of the secretariat and hand over the blocks for demolition. The plan is to raze the entire complex by the end of this year and build a vaastu-compliant structure. The only thing now standing in his way is the Hyderabad high court which has put on hold the demolition following a petition by an opposition legislator. The Telangana government lawyer has told the court that the complex is being demolished for administrative convenience and because the building is a fire hazard. Several people in Telangana and Andhra Pradesh do follow vaastu to determine the right wind flow and light inside an office or residential space. Others take it further - they use it to determine even little things like the direction the head of a department or ministry should face, and sometimes even the location of the toilets. This building was constructed on the advice of vaastu experts by the former Andhra Pradesh chief minister YS Rajasekhara Reddy in 2005. He died in a helicopter crash four years later. His successor, K Rosaiah, made some modifications on the advice of a vaastu expert but he lost power in a year. PS : A few years ago, a friend of mine from Andhra had visited Chennai and stayed in a good hotel. For dinner, we went outside to a small Andhra hotel – (my friend was in an inebriated condition). After food, he asked the person sitting at the counter, how the business was and the owner replied stating that all is not well. The friend offered free advice stating that his washbasin is in a wrong place (water should not be in that corner).. .. .. .. a couple of months later, smitten by curiosity, I went to the same hotel, only to see that cash counter had shifted to the place where wash basin had earlier been, and wash in the place where counter earlier was ! – all on the expert advice ! !